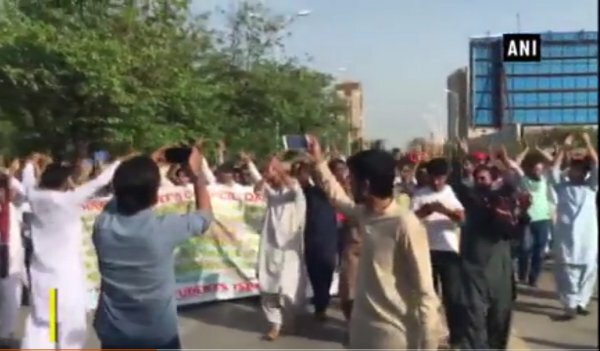 On Wednesday 23 May 2018, students from Islamabad carried out a rally in the Pakistani capital city in support of the thousands of Sindh victims of enforced disappearances since 2010. Human rights activists, members of the civil society and members of nationalist parties then showed their support by demonstrating in Hyderabad and Karachi on Thursday 24 May 2018. The rallies culminated with a currently ongoing three-day hunger strike for the release of all missing persons in Sindh. The whereabouts of 146 Sindhi citizens are currently unknown. Video courtesy of ANI News. Activists of human rights organisations, members of civil society and nationalist parties on Thursday [24 May 2018] took out rallies and observed hunger strike on Thursday [24 May 2018] in protest against ‘enforced disappearances’ in Sindh. Activists of civil society organisations and general public observed a hunger strike for 72 hours under the aegis of Youth Action Com­mittee (YAC) outside the Hyderabad Press Club in protest against 146 ‘missing persons’ of Sindh. Dripping with perspiration the charged youths led by Shahzad Lashari, Sindhu Nawaz, Hamza Chandio, Mehran Buriro and Sohail Bhutto demanded that all 146 missing persons should be recovered immediately and if anyone was found guilty, he be produced in court. They called for arrest and exemplary punishment to all the personnel of the law enforcement agencies invol­ved in torturing peaceful protesters and the heirs of the missing persons outside Karachi Press Club, and the arrest of policemen involved in torturing members of Mehran Council of Quaid-i-Azam University Islamabad. The students were protesting against enforced disappearances outside Islam­abad Press Club on Wed­nesday when police attac­ked them, they said. They said that after 72-hour hunger strike, YAC would set up hunger strikers’ camp in another district and it would remain pitched till all missing persons of Sindh were recovered safely. Jeay Sindh Mahaz-Riaz chairman Riaz Ali Chandio visited the hunger strikers’ camp to express solidarity with the protesters. Those who were picked up were not being produced in courts and when their heirs protested they were stopped from raising voice against the injustice, he said. He demanded that all nat­io­nalist, political and rights activists, writers and others who had been ‘disappeared’ be recovered immediately. Neelam Arijo, daughter of Khadim Hussain Arijo who went missing on April 17 last year, complained to Mr Chandio that he too had come to them after torture on protesters in Karachi. Jeay Sindh Qaumi Mahaz-Arisar leader Ameer Has­san said that 19 activists of his party and 64 activists of other nationalist parties had disappeared. They would launch a movement soon if the government failed to recover them, he warned. Human Rights Commis­sion of Pakistan special task force coordinator Dr Ashothama Lohana, peasant leader Punhal Sario, Sindhi writer Jami Chandio, Prof Imdad Chandio, Ali Palh advocate, Women Act­ion Forum activist See­ma Jafri and others joined the protest and delivered fiery speeches against “enforced disappearances”. They said that federal and provincial governments must play their role in safe recovery of all missing persons. They said that it was unjust to pick up any citizen clandestinely and make him disappear. They condemned torture on peaceful protesters in Karachi and Islam­abad who were demonstrating against enforced disappearances.